The pathogenesis is the sequence of events that occur during the development of any disease or abnormal condition. Periodontal, exists in three main conditions: health, gingivitis and periodontitis (Fig. 3-1 and 3-2). 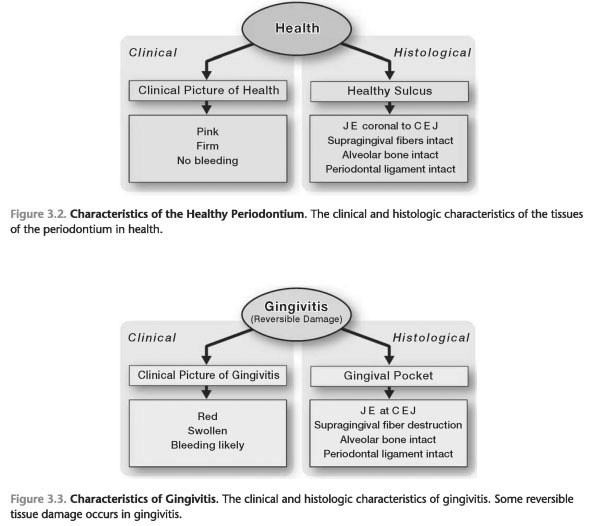 It is important to understand the differences between health, gingivitis and periodontitis (table. 3-1). This section provides an overview of the three main States in clinical and microscopic levels. The term " periodontal disease, not to be confused with the term of periodontitis. Gingivitis and periodontitis are two main categories of periodontal disease. Gingivitis is a bacterial infection that comes down to the gum. 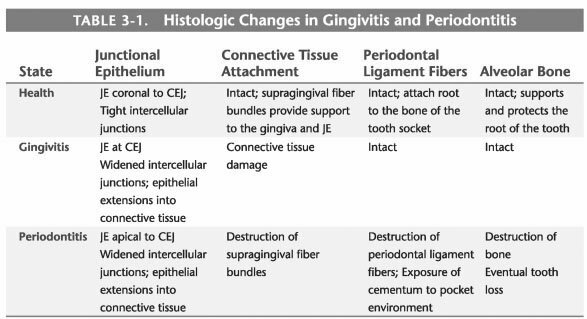 Tissue damage that occurs in gingivitis results in reversible destruction of periodontal tissues (Fig. 3-3). Periodontal disease is a bacterial infection that is all part of periodontal disease, including gums, periodontal ligament, bone and cement. Tissue damage that occurs in periodontitis can lead to irreversible destruction of periodontal tissues (Fig. 3-4).